This chapter continues on the hard disk devices from the previous one. Here we will put partitions on those devices. This chapter prepares you for the next chapter, where we put file systems on our partitions. Linux requires you to create one or more partitions. The next paragraphs will explain how to create and use partitions. A partition's geometry and size is usually defined by a starting and ending cylinder (sometimes by sector). Partitions can be of type primary (maximum four), extended (maximum one) or logical (contained within the extended partition). Each partition has a type field that contains a code. This determines the computers operating system or the partitions file system. We saw before that hard disk devices are named /dev/hdx or /dev/sdx with x depending on the hardware configuration. Next is the partition number, starting the count at 1. Hence the four (possible) primary partitions are numbered 1 to 4. Logical partition counting always starts at 5. Thus /dev/hda2 is the second partition on the first ATA hard disk device, and /dev/hdb5 is the first logical partition on the second ATA hard disk device. Same for SCSI, /dev/sdb3 is the third partition on the second SCSI disk. 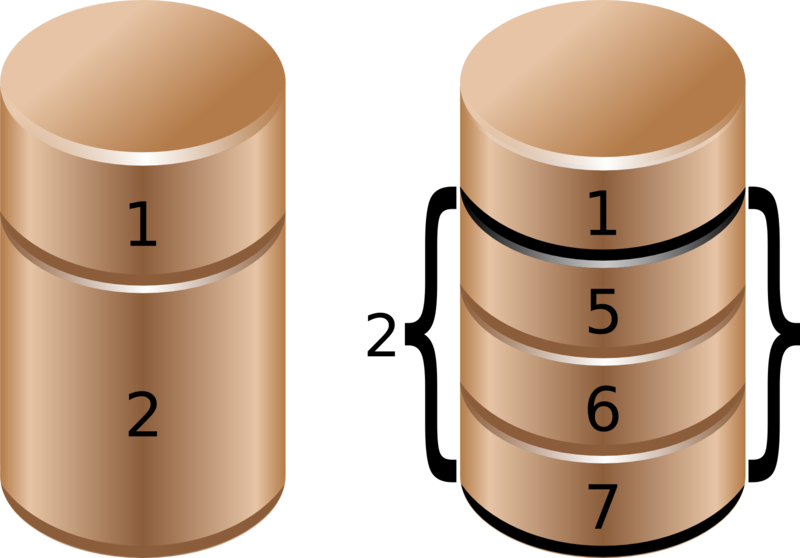 The picture below shows two (spindle) disks with partitions. Note that an extended partition is a container holding logical drives. In the fdisk -l example below you can see that two partitions exist on /dev/sdb. The first partition spans 31 cylinders and contains a Linux swap partition. The second partition is much bigger. The /proc/partitions file contains a table with major and minor number of partitioned devices, their number of blocks and the device name in /dev. Verify with /proc/devices to link the major number to the proper device. The major number corresponds to the device type (or driver) and can be found in /proc/devices. In this case 3 corresponds to ide and 8 to sd. The major number determines the device driver to be used with this device. The minor number is a unique identification of an instance of this device type. The devices.txt file in the kernel tree contains a full list of major and minor numbers. You may be interested in alternatives to fdisk like parted, cfdisk, sfdisk and gparted. This course mainly uses fdisk to partition hard disks. parted is recommended by some Linux distributions for handling storage with gpt instead of mbr. Below a screenshot of parted on CentOS. In the example below, we bought a new disk for our system. After the new hardware is properly attached, you can use fdisk and parted to create the necessary partition(s). This example uses fdisk, but there is nothing wrong with using parted. First, we check with fdisk -l whether Linux can see the new disk. Yes it does, the new disk is seen as /dev/sdb, but it does not have any partitions yet. Then we create a partition with fdisk on /dev/sdb. First we start the fdisk tool with /dev/sdb as argument. Be very very careful not to partition the wrong disk!! Inside the fdisk tool, we can issue the p command to see the current disks partition table. No partitions exist yet, so we issue n to create a new partition. We choose p for primary, 1 for the partition number, 1 for the start cylinder and 14 for the end cylinder. We can now issue p again to verify our changes, but they are not yet written to disk. This means we can still cancel this operation! But it looks good, so we use w to write the changes to disk, and then quit the fdisk tool. Let's verify again with fdisk -l to make sure reality fits our dreams. Indeed, the screenshot below now shows a partition on /dev/sdb. The partition table information (primary and extended partitions) is written in the master boot record or mbr. You can use dd to copy the mbr to a file. This example copies the master boot record from the first SCSI hard disk. The same tool can also be used to wipe out all information about partitions on a disk. This example writes zeroes over the master boot record. Or to wipe out the whole partition or disk. Don't forget that after restoring a master boot record with dd, that you need to force the kernel to reread the partition table with partprobe. After running partprobe, the partitions can be used again. The partition table does not contain information about logical drives. So the dd backup of the mbr only works for primary and extended partitions. To backup the partition table including the logical drives, you can use sfdisk. This example shows how to backup all partition and logical drive information to a file. The following example copies the mbr and all logical drive info from /dev/sda to /dev/sdb. gpt was developed because of the limitations of the 1980s mbr partitioning scheme (for example only four partitions can be defined, and they have a maximum size two terabytes). Since 2010 gpt is a part of the uefi specification, but it is also used on bios systems. Newer versions of fdisk work fine with gpt, but most production servers today (mid 2015) still have an older fdisk.. You can use parted instead. parted is an interactive tool, just like fdisk. Type help in parted for a list of commands and options. This screenshot shows how to start parted to manage partitions on /dev/sdb. Each command also has built-in help. For example help mklabel will list all supported labels. Note that we only discussed mbr(msdos) and gpt in this book. We create an mbr label. Once labeled it is easy to create partitions with parted. This screenshot starts with an unpartitioned (but gpt labeled) disk. This example shows how to create two primary partitions of equal size. Verify with print and exit with quit. Since parted works directly on the disk, there is no need to w(rite) like in fdisk. 1. Use fdisk -l to display existing partitions and sizes. 2. Use df -h to display existing partitions and sizes. 3. Compare the output of fdisk and df. 4. Create a 200MB primary partition on a small disk. 5. Create a 400MB primary partition and two 300MB logical drives on a big disk. 6. Use df -h and fdisk -l to verify your work. 7. Compare the output again of fdisk and df. Do both commands display the new partitions ? 8. Create a backup with dd of the mbr that contains your 200MB primary partition. 9. Take a backup of the partition table containing your 400MB primary and 300MB logical drives. Make sure the logical drives are in the backup. 10. (optional) Remove all your partitions with fdisk. Then restore your backups. Some partitions will be listed in both outputs (maybe /dev/sda1 or /dev/hda1). Choose one of the disks you added (this example uses /dev/sdc). The newly created partitions are visible with fdisk. But they are not displayed by df.